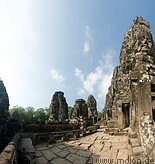 The Bayon is the second most famous temple of the Angkor complex after Angkor Wat. It lies at the exact centre of the Angkor Wat city and was built in the late 12th or early 13th century as the official state temple of King Jayavarman VII. Its most striking feature are its 54 gothic style towers with smiling face of Avalokiteshvara, the bodhisattva (= Buddhist saint) who embodies the compassion of all Buddhas.